Another day ... another body. The small town of Lakewood can’t seem to escape the bloodshed in Season 2 of MTV’s “Scream” Series. With no other options, Audrey’s forced to leave his decaying body in the storage locker. But will it stay in there? That’s the question when Audrey heads back to the locker in the morning with Noah (John Karna). Noah is certain he’ll find some clues about Piper’s (Amelia Rose Blaire) accomplice inside, and that’s something that worries Audrey. She winces as he opens the unlocked door, but Jake’s body is gone. A couple of pieces of old furniture are the only things sitting in the storage locker, leading Noah to believe that the motel clerk was playing him. However, a surveillance camera installed inside the locker gives him some hope. He steals it hoping he’ll be able to see if anyone else broke in to search for clues before him. As Audrey panics over what Noah may find on the camera, Emma (Willa Fitzgerald) goes to meet her estranged father. Her mom, Maggie (Tracy Middendorf), wasn’t happy that she was meeting him for breakfast, and Audrey even warned her to be careful. Despite the concern, Emma is hopeful that her dad may shed some light on why he abandoned her so many years ago. Unfortunately, she doesn’t get the answers she’s looking for. Although he does apologize for leaving, and says he wanted to come back, he can’t explain why he left her in the first place. Elsewhere, Brooke (Carlson Young) is dealing with her own problems while at the Lakewood Pageant rehearsal. It may be a great opportunity to get a scholarship and give back to the community, but Brooke is more worried about getting in touch with Jake. Zoe (Kiana Ledé) tries to help her get her mind off of her MIA ex, but Brooke spots Stavo (Santiago Segura) in the auditorium. She thinks the Sheriff’s son is stalking her — and he very well may be. He continues to ask about Jake, further frustrating the blond beauty. Stavo seems to have a weird obsession with Brooke and Jake. Could he be the new Brandon James killer? That’s the last thing on Audrey’s mind as she watches Noah hook the surveillance camera up to his computer. He’s in the process of getting access to the file when Audrey decides to make a bold move. She grabs a heavy bookend and is ready to knock Noah out with it when a window pops up that says “no media detected.” Audrey dodged a bullet — for now at least. Things aren’t going any better at Emma’s house. Maggie goes to the door only to discover that her ex-husband is there to see her. He explains that Riley (Brianne Tju), Emma’s friend, has been emailing him with concerns about his daughter. But Maggie says that’s not possible. Piper murdered Riley months ago. The estranged couple goes to see Sheriff Miguel (Anthony Ruivivar), who has a history with them. He was one of the teens that went to high school with Brandon James 20 years ago, and seemingly used to be friends with Maggie’s ex. He thinks the emails are just a case of stolen identity, but Maggie encourages him to further investigate based on the history the town has. Too many coincidences are happening, from Riley’s emails to the arrival of Emma’s dad. Another shady coincidence is the return of Mr. Branson (Bobby Campo). He calls Brooke from an unknown number, citing Shakespeare and telling her that he knows she split from Jake. This infuriates Brooke, who tells her twisted former teacher to get a hint and stop calling her. With all the chaos happening in town, Emma is just trying to find a little bit of peace. She receives a message from her dad saying he has an answer for her and can be found at the Crescent Palms motel. Desperate for answers, Emma decides to give her dad another chance. But is the message truly from him? Before Emma can head to the motel, the front desk clerk goes to her father’s room to deliver a bottle of wine and a cork screw. The door is propped open, so the clerk enters. Once inside he discovers the light switch isn’t working and everything is covered in plastic. As he approaches the bathroom door, the Brandon James killer emerges from behind him. He takes the bottle of wine and knocks the front desk clerk over the head. Still conscious, the clerk attempts to call for help. But unfortunately for him, no one can hear him. The killer uses the corkscrew to repeatedly stab him in the back before finally jabbing it through his neck. Emma arrives at the motel shortly after and finds no one at the front desk. Meanwhile, Audrey gets another message from the killer, telling her to go to the Crescent Palms motel or the video of her with Jake’s body will be released. Although she was supposed to meet Noah at the movies, she hops in her car to head to the motel. Discovering her father’s name in the motel log, Emma goes up to his room. Just like the clerk before her, she finds the door propped open. The room is clean when she enters, but newspaper clippings about her and the recent murders are strewn across the dresser. Elsewhere, Noah is waiting for his friend when he’s approached by Stavo, who tells Noah that he likes his podcast, but one thing is bothering him. What is Noah going to do if and when he discovers who Piper’s accomplice is? He warns Noah he may get hurt ... or worse. The two are interrupted by the arrival of Brooke and Zoe. Brooke planned the whole night as a way to set up Noah and Zoe on a date. And needless to say, she’s not happy to see Stavo. But Stavo does come in handy when Brooke runs into Mr. Branson inside. Branson claims it’s a complete coincidence that they are at the same place, but Brooke doesn’t see it that way. She truly believes that her former teacher/lover is stalking her. “You never gave me a chance to explain,” Branson argues, adding that he still cares about her. Back at the hotel, Emma is still trying to figure out why her dad would have those newspaper clippings. Meanwhile, the killer calls Audrey from the bathroom and reveals that Emma is in the room. Audrey tries to call Emma’s phone to warn her to leave, but Emma ignores the call. This forces Audrey to call the police, sending them to the Crescent Palms motel. Emma is about to walk into the bathroom, where the killer and the motel clerk’s body are, when she’s distracted by a fight outside. She leaves and discovers her dad is drunk and fighting at the bar next door. Emma is horrified to see her dad in this state, and breaks up the fight. It’s only then that her dad reveals the truth. He never cut out those newspaper clippings, and he never left her a message. In fact, he was checked out of the Crescent Palms motel and had all of his belongings in the car. He was ready to leave again without giving Emma any of the answers she needed. But her dad had a good reason. He finally confesses he has a drinking problem, and it got so bad when Emma was younger that he actually attacked her mother. When Emma was younger he tried to put her in his car after he’d had a little too much to drink. Maggie tried to remove Emma from the car, which is when her dad lost control. He fractured Maggie’s jaw. Maggie never told Emma the truth in order to allow her to remember her father in a better light. Emma’s shocked at this reveal, but doesn’t have much time to process it. The police and Audrey arrive, and Audrey tries to cover her tracks. She tells the police she called because she thought Emma was in danger. She says she didn’t realize it was her father fighting. 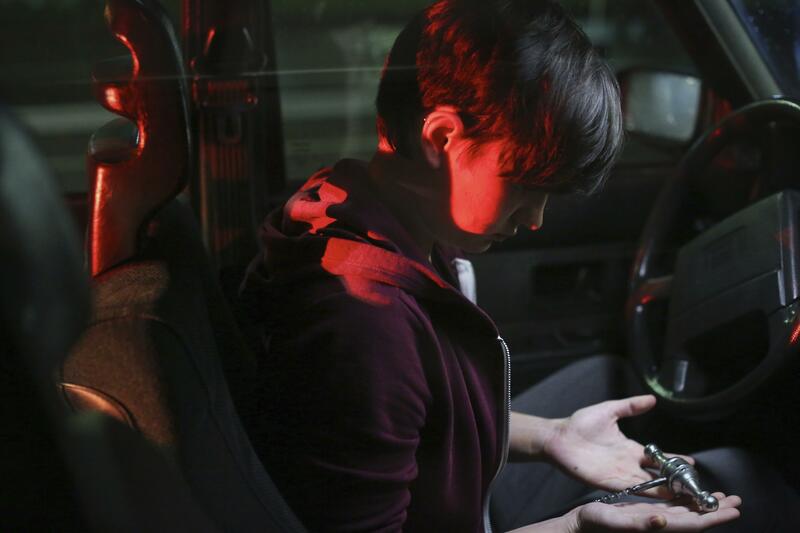 The two teens part ways, but there are consequences for Audrey calling the police. The Brandon James killer texts her and tells her to look under her seat. Audrey feels around and pulls out the bloody corkscrew that the killer used to murder the clerk.